When the Black Death struck Florence the small town of Grassina just south of the city was miraculously spared. To give thanks the town organized a solemn procession on Good Friday in 1633. The tradition continues through today with the Good Friday passion play and procession, attracting hundreds of participants and thousands of spectators. On Friday, April 14, beginning at 8:30 pm, two simultaneous events take place. 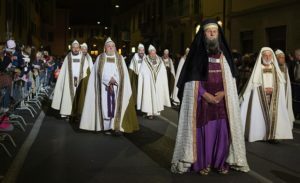 The streets of Grassina will be transformed into the avenues and alleys of Jerusalem as 500 participants in historic costume represent the Romans and the Jews. The suffering Christ, as well as the two thieves who were crucified alongside him, can be seen in the pageant as it moves towards a nearby hill crowned with olive trees and oaks, the Biblical Golgotha. At Calvary Hill, the reenactment of the passion and crucifixion of Christ takes place. The Good Friday pageant, accompanied by color, sound and lights, provides a dramatic beginning of the Easter weekend. Like Florence, Greve in Chianti also creates a pyrotechnics display on Easter morning in the town’s triangular-shaped central square Piazza Matteotti. If the resultant flight of the colombina, or dove, goes smoothly and ignites fireworks on a cart, townspeople consider it a good omen for the spring season and fall harvest in this center of the Chianti wine region (12 noon). Many Tuscan towns host markets on Easter Monday, a day most Italians are free from work. Siena: Easter Monday market featuring food, ceramics, leather goods, books and toys. Vinci: The birthplace of Leonardo da Vinci offers a market of handmade items. Greve in Chianti: Set in central Piazza Matteotti, one of the largest antique markets in Tuscany on Easter Monday.